With six months to go, there is nothing you need to do in this moment except mark your calendars for Saturday November 21 and spread the word. 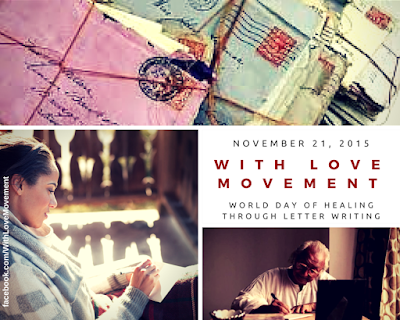 Regardless of where you are in the world, we will collectively revive the art of letter writing by writing letters to whom ever our heart desires - even if it means writing a letter to ourselves. It will be a monumental healing of our souls. If you happen to be on Face Book, like the With Love Movement page for updates. We have over 4,100 people from across the world who have joined us and those numbers are increasing daily. This is also a great time to plan that letter writing party. Website coming soon! In the meantime, contact me (iamfreedomsdrum@gmail.com) for more information and know that I am available to travel throughout the year for letter writing workshops and to talk about the With Love Movement!